Ugh! ; Geometry on a tour? ; I bet you thought you passed that class long ago. ; If you can bear to remember your geometry classes, you will find that the origins of mathematics and how it was used by the ancients to construct their cities and temples has not changed that much over time, it has just become more complex (and has fueled the success of hand calculators). ; The essentials remain the same:; a circle, a square, a rectangle, and the myriad permutations of those forms. Exactly where geometry came from we are not sure, but the source has moved a little East of where people used to think it came from. ; From Classical Greece, where it received its most philosophic and poetic applications (and from where Western cultures inherited it), geometry�s origins moved first to Egypt and Mesopotamia, and then to the Armenian plateau, where the earliest known cities are located. ; For without geometry, you cannot build anything, and its knowledge was key to survival, and believed to be a key to unlocking the secrets of the universe. Almost literally, geometry meant contact with the gods. ; It was considered a way of imitating the structure where the sun (probably the first god) and the moon (probably the second god) governed the natural order-- early man believed if he could "map" the universe, he would be able to predict the whims of gods, who sent punishing droughts, floods and pestilence on the land around him. Geometry was also a fundamental tool for making things by hand. ; Without it, you simply can�t. ; You may not be aware of it, but when you shape any object, you are following the laws of geometry, which is based on an even older skill--that of measures, or counting. ; In the ancient world, this knowledge was considered magic, and as magic, it was kept in the realm of religion, in the realm of priests, a carefully guarded secret which was passed on only the elect. ;; As the image of the structure of the universe, geometry was a symbolic system; for understanding how it worked, including astronomy. Ancestral Armenians had a refined knowledge of astronomy and were able to predict astral events to an accurate degree. ; The oldest known observatories in the world are in Armenia. ; One is called Karahundj. ;; "Kara" means "of stone" or "stones", and "henge" has no specific meaning in English, it either is a forerunner of "hung" or is borrowed from an old Indo-European root. ; Like Stonehenge, �Karahundj� is easily defined in the first part, but the second is up to theory. ; �Hundj� may be an early version of �pundj�, meaning �bouquet�, or it might be related to �hunchuin�, which means �voice�. Other henges--there are many throughout Europe -- have the ending "-nish" or "-nich", which in Armenian means "sign". ; Consistent among all of them is the first sound "Kar" or "Kal", which means stone. Sacred numbers are numbers with have special symbolic meanings. ; Their importance is rooted in mystical belief--if you used these numbers in measuring, or follow them on certain dates and in combinations, you were appeasing the gods, and affirming yourself as a member of their metaphysical family. This is by no means complete, but it will give you an idea of what to look for when you see the monuments in Armenia. ; By counting out the steps, sizes, and shapes with these numbers in mind, you will be unlocking the secrets of Sacred Architecture in Armenia, from its earliest time through the Middle Ages. ; Sacred numbers should not be thought of as mere proportional ratios in creating beautiful buildings. ; They were rooted in a profound belief in the will of a god to bring order into the universe. ; They were not thought of as human invention, but part of the laws of the universe which humans were blessed in using. 1 - This number represents unity. ; Since it is part of all numbers it represents the ideal symbol of deity. ; It is the origin, the elementary. 2 - Polarity and rupture. ; It is the coming apart of unity--yin yang, good and evil, man and woman, the realm of opposites. 3 - The holiest of all numbers, it is still a part of our unconscious thinking. ; The triangle, the habitual use of threes in listing things, even the classic comic technique of repeating something 3 times, with the 3rd repetition altered slightly to make the punch line. In religion, the highest deities are in threes: Babylon had Anu, Bel and Ena;; India had Brahma, Vishnu and Shiva; Greco-Roman Jupiter, Juno and Minerva, and the Christian Holy Trinity, Father, Son and Holy Spirit. 4 - The number four was associated with basic divisions of matter and space:; the four cardinal points, the four humors of the body, the four horsemen of the Apocalypse, the four rivers of paradise, the four cardinal virtues, the four winds, the four seasons, the four main prophets and the four evangelists. 5 - The number five consists of two unequal parts, 2 and 3.; The diversity brings evil and misfortune. ; The five symbolizes the individual (one who defies the natural order and is punished), the five fingers on the hand, the pentagram. 6 - God created the world in six days. ; Six is the sum of 3+3 or 1+2+3. ; Therefore it is perfect. ; Christ was crucified on the sixth day of the week, and he died in the sixth hour of the day. 7 - From earliest times this number was associated with celestial beings and spiritual forces; seven days in a week, the seven known planets (including the sun and the moon); the 7 evil spirits, the seven levels of a ziggurat (astral tower built by the Babylonians--the most famous being the Tower of Babel);; according to St. Augustine, seven symbolized the perfection of God--he created the world and rested n the seventh day; Christian life is ordered by seven; seven capital sins, seven virtues, seven sacraments. 8 - the first number after seven, the symbol of life, the new life after baptism (both in pagan and Christian times). ; In Christian belief, the resurrection of; Christ happens on the eighth day. 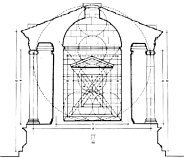 ; The octagon is the favored form for the baptismal font. 9 -; the result of 3x3, nine represents an even greater holiness found in three. 10 - According to St. Augustine, this number signifies perfection, because it is the sum of 3+7. ; It is found in the ten commandments, consisting of 3 laws pertaining to the love of God, and seven to the love of one�s neighbor. ; In Hebraic liturgy it can be found in the ten shores of Egypt, the ten ropes of the tent of the tabernacle, the height of the cherubs in the temple and the ten horns of the apocalyptic beast. ; Ten is the round and perfect number that forms the basis of the decimal system and is the universal number for the Pythagoreans. 12 - This number formed the basis of the Sumerian and Babylonian numerical system. ; It holds the twelve signs of the zodiac, the twelve months of the year, the twelve hours of the day. ; It was significant in Jewish religion:; the twelve gates of paradise, the twelve tribes of Israel, the twelve bronze calves. ; In Christianity:; the twelve apostles, the twelve stars around the head the apocalyptic woman, etc. In sacred geometry, numbers are combined with shapes to create a harmonious whole. ; The idea was to reunite humanity with the cosmic whole. ; Similar geometric patterns can be found in Sun Worship Temples throughout Mesopotamia and the Armenian Plateau, the shrines of Isis in Egypt, tabernacles of Jehovah, sanctuaries of Marduk, Christian churches and Islamic mosques. ; Throughout history, there are few basic geometrical forms which all the universe is composed, and can be generated by the means of two tools used by mathematicians ever since:; the straight edge and the compass; their construction does not require measurement. Circle; possibly the earliest figure drawn by human begins. ; Occurs frequently in nature (the sun, the moon). Equilateral Triangle is derived from the intersection of two circles drawn through each other's center. ; Polygons can be made by adding equilateral triangles. Pentagram (derived from the pentagon) was in ancient times a symbol for health and salvation, and in the Middle Ages used as a symbol to repulse evil spirits. ; As a geometric form it has a multitude of different meanings. ; Its special relationship to the golden section represented the possibility of infinite divisions in both directions, making it more mystical. Hexagon is made by dividing the circumference of a circle by its radius. ; The simple construction method of this form gave it special meaning, and it could be observed in nature (beehives, the forms of basalt rocks), and had one symbolic form in �Solomon�s Seal�. Golden Section is a ratio that has been used extensively throughout history to erect buildings, create artwork, etc. ; This ratio can be reproduced with root rectangles and their derivatives. Finally, all of this is combined to create complete harmony throughout a building. ; Every part is fixed in shape and size. Nothing can be added or removed without disturbing the harmony of the whole composition. Garni:; The 1st c. CE temple of Garni was built along Hellenistic classical lines, but embodies much of the sacred numerology and geometry devised by Ancestral Armenians 4200 years earlier. ; With a column to inter column ratio of 1/3 (1 being the primary number of the universe; 3 being the holiest of all numbers, representing the Greco-Roman triad Jupiter, Juno and Minerva). ; The angles and measures used in designing the temple can be seen as both aesthetically beautiful, and as a reaffirmation of the universal laws that governed man�s destiny. ; Angles, number of columns, dimensions--these were all created with a careful eye to appeasing the gods and protecting the human from their wrath. In fact, the structure itself is a representation of the cosmos, with a raised platform and 9 Steps leading to the main entrance (nine is three times the holy triad),; 24 columns representing the clouds or vapors, and the ceiling a dome of the heavens, and sophisticated use of the equilateral triangles, squares, pentagons and hexagons in its design. ; The columns are arranged with 6 in front and back (considered a perfect number) and 8 on the sides (the first number after seven, the symbol of life). Figure 1 shows the front of the temple with geometric patterns. ; A circle can be made beginning with the first step and rising to the top edge of the cornice. ; Note how the circle is dissected by imaginary lines drawn from key points in the building. ; Two perfect equilateral triangles are formed, which draw your attention to another three equilateral triangles inside, which again draw your attention to another set of triangles -six triangles having 3 sides (6x3 or 18). ; This might be confusing, but a little calculation can help. ; Each set of three triangles has a combined 9 sides. ; 9 is 3 x 3, or the holiest number doubled. ; The priests and faithful would ascend 9 steps (again, the holiest number doubled), which also represented the 7 known planets, plus man on earth, god above. ; Each set of three triangles is mirrored by another set,; one pointing from heaven down, the other from earth up. ; Where they come together is a perfect square shaped like a diamond--which forms;; the Inner sanctum, where the deity lay. The diamond square happens to form the exact dimensions of the inner walls of the sanctum. The mirrored triangles are also the point where man and god may meet--the powers above giving enlightenment to the earth below. ; And still we have the number 18, which is not on our list of sacred numbers. ; Or isn�t it? ; Sacred numerology was not only the numbers themselves, but also their combinations. ; Add the numbers in 18 (1+8) and you have... a nine. ; Again the repetition of nine:; nine steps, nine sides to each set of triangles, or 18 sides to the triangles, (also a 9). ; In the number 18, there is 1 (the elemental, unifying number) and 8 (the eight cardinal directions). ; Combined with the square,; the 18 sides of the triangles and the four sides of the square equal 22 (or in sacred numerology, 2+2 = 4). ; Four corners of the world. the four seasons--both time and space. ; This temple was the holiest of holy, a symbol of the deities controlling all earthly matter to represent everlasting time, all that is, all that was, all that ever will be. The circle and triangles draw your attention--even if unconsciously-- to the inner sanctum--exactly to the point where the statue of Mythra the goddess stood. In Figure 2, the inner sanctum has imaginary lines showing a; perfect circle (1 = the unifying whole), with a group of 6 (3+3, the perfect number) circles placed within. ; The lower four fill the space where the statue and eternal fire were placed. ; Dissecting the lower circles with angles, again creates three sets of perfect triangles, reinforcing the number 9 from the outer temple design, and again the triangles meet at the point where the goddess stood. ; Most probably on her face. ; The numbers 8 and 5 are repeated in the dimensions of the lines of measurement. ; Eight is the symbol of life, the day of resurrection, the day after god rested, and the symbolic day when earth�s history really began. ; 5 is a misfortune number in some cultures, but with the Greeks and early Armenians, it was also the sign of the pentagram, the sign of making things (the five fingers). ; Note that in side the sanctuary, 5 is always the length of horizontal lines, while 8 is always the length of vertical lines. ; Cosmically this would mean that the resurrection and new life which came from above and below (some gods lived in the under world), met the horizontal human world, unable to enter the realm of the gods without their help. And so it continues throughout the entire temple. ; Count lines, distances, add them, and you will always end with a sacred number. ; This is perhaps superstition to us, but to the people who created this temple, it was the perfect embodiment of their communion with the universe. ; It should be remembered also, that this continuous system of sacred geometry was only used in sacred buildings. ; Secular buildings might imitate the system in some ways, but they never equaled the staggering formulas and calculations to be found in sacred buildings. When Christianity came to Armenia, as it did in Rome and Europe, it often usurped pagan traditions, converting them to a Christ-given tradition that facilitated conversions. ; This is not a slight against Christianity--it would be almost impossible to find any religion that rose completely on its own without borrowing some traditions from the past. In Armenia, Saint�s days and ceremonies coincide with earlier pagan days (just as the Roman Catholic December 25 celebration of the birth of Christ coincides with the Roman holy new year). ; This conversion of paganism to Christianity included the use of sacred numbers and geometry--if Christ came to renew the world, then he came to renew all that was in it. The first Armenian churches were built on the orders of St. Gregory the Illuminator, and were often erected on top of pagan temples. ; Just as Garni was built on top of an Urartian temple, and shows strikingly similar dimensions to the temple of Sushi at Erebuni, the first churches imitated the pagan temples, altering certain details to differentiate them from their predecessors. ; But a closer look at them shows that even with the most unique developments in Armenian sacred architecture (drum, conical roof dome, the cruciform shape of the church), a rigorous and consistent compliance to sacred geometry prevailed. The first churches were built according to the vision of St. Gregory. ; In the vision, St. Gregory described the composition of the church and the interpretation of its elements. ; "The main site was marked with a circular base of gold on which rested a column of fire and a capital of cloud, surmounted by a cross of light. ; The sites for the martyr�s chapels were marked with red bases, columns of clouds, capitals of fire, and crosses of light; these columns were lower than the column of light. Above everything stood four crosses, vaults fitted into each other. ; The whole construction was surmounted by a wonderful canopied construction of cloud in the form of a dome". Metaphysically, some the symbols of his vision are that the canopy stands for the celestial city, the meeting place of the kingdom of heaven. ; The church is the meeting place of the faithful, where they can commune with the world above. ; Physically, the vision of St. Gregory is the description of the church itself, with the domed or canopied roof supported by vaults (crosses) that rest on pillars. ; These basic principles have governed the construction of all Armenian churches since then. The twelve stones were then distributed to the four sides of the square, three stones to each side. Barely describing the ritual for establishing an Armenian church, this does give a good idea of the use of sacred numbers and geometry in the ritual itself. Continuing the tradition of sacred buildings from earlier pagan temples, Armenian builders developed their own type of architecture. 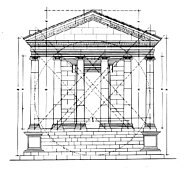 ; For basilica plans, the ratio was 1/2 (1+2 = 3; or 1 and 2 as sacred numbers in themselves), and for rectangular plans the ratio was 1 square root of 2.; The unit of measurement in Armenia was the foot (29.5� 29.7 cm), long used by the Greeks and Romans. 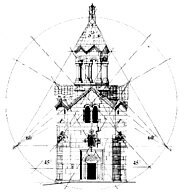 One example of early Armenian architecture in sacred numbers and geometry is figure 3:; Haghbat bell tower. ; Note how the angles of the triangles form sacred numbers (60� = 6+0 = 6; 45� = 4+5= 9). As you visit both pagan and Christian sacred sites,; begin to divide the shapes into their geometric patterns. To the simple person, they may simply look harmonious and somehow fitting--look at it with some knowledge of sacred geometry, and you begin to understand why it was built the way it was.